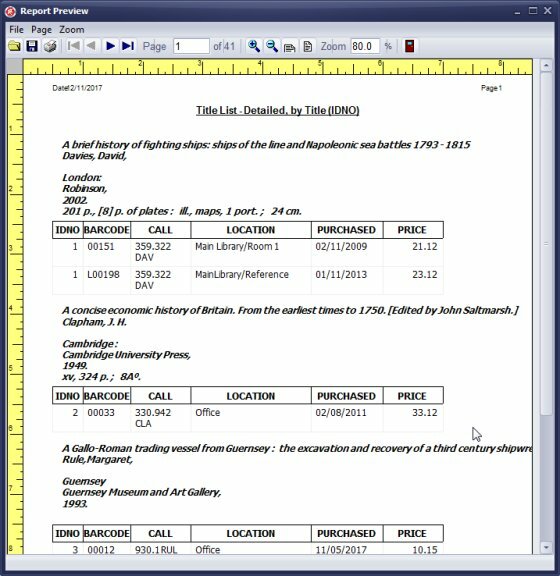 Help, how to topics > Print reports > How to define library detailed list report? How to define library detailed list report? item information, will be displayed in the group section: title, author, place published, publisher, date published, physical information, ISBN. copy data, will be displayed in the table form below the item data: barcode number, purchase date, price, location, call number. In the main catalog window click New Report. 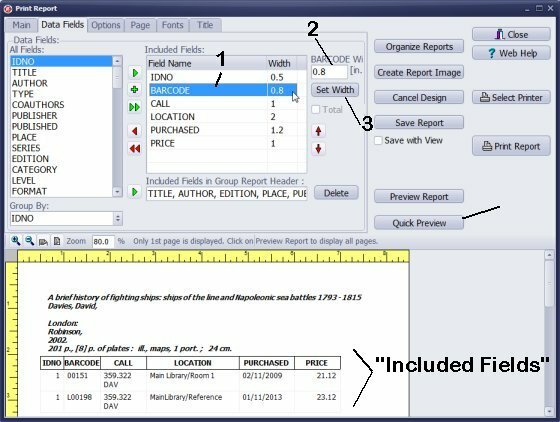 Select data field in the All Fields (1) box. Click the Green Arrow (2) icon to include the field in the Included Fields (3) box. Data fields listed in the Included Fields box: IDNO, BARCODE, CALL, LOCATION, PURCHASED, PRICE. Group By: select IDNO data field in the Group By (1) box. Every item in your library has a unique IDNO value. If the item has several copies, all those copies will have the same IDNO value. 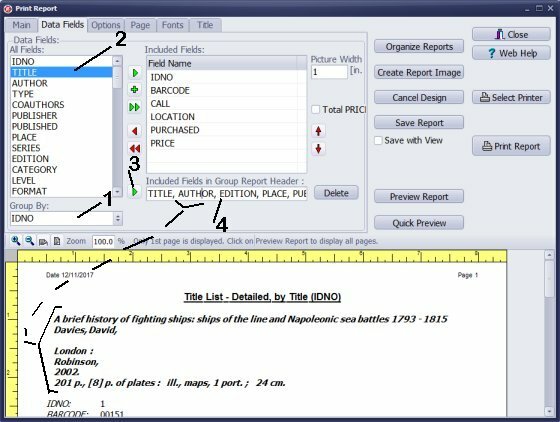 Grouping by IDNO will allow us to include all copies data right below the group header. 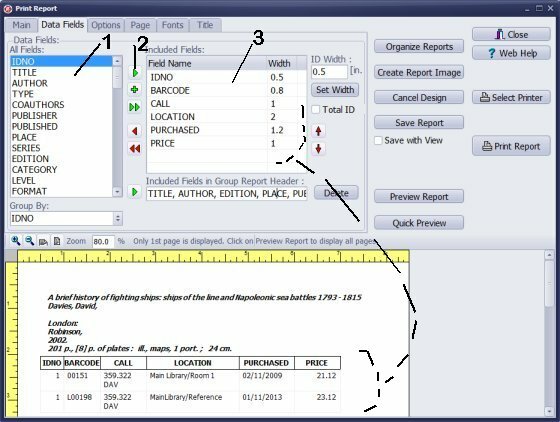 Group Header: to define the group header select the data field in the All Fields (2) box and click the Green Arrow (3) icon. 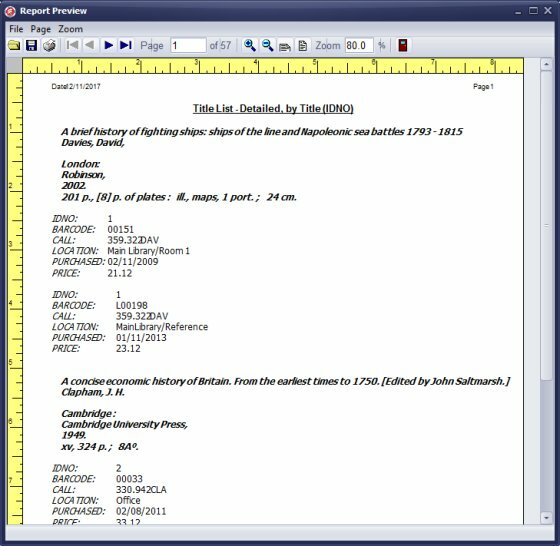 In this sample the following data fields are included in the group header: TITLE, AUTHOR, EDITION, PLACE, PUBLISHED, PHYSICAL, ISBN. How to define a column width? Click on the data field (1) in the Included Fields box. Modify the value in the Barcode Width (2) box. Click Set Width (3) to save the new value. The total width should be smaller than the page width. How to define new font type, style, and size? Click Change Font select and define new font. 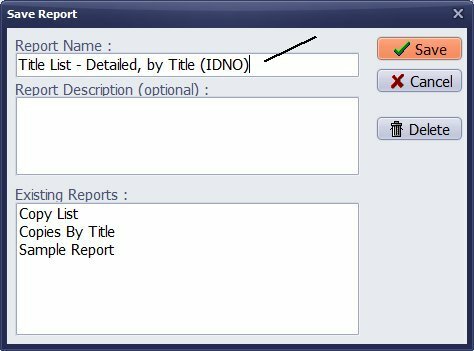 How to define the report title? Click the Title tab. Enter report title into the Report Title box. To review the report click Preview Report. How to save a report to PDF file? 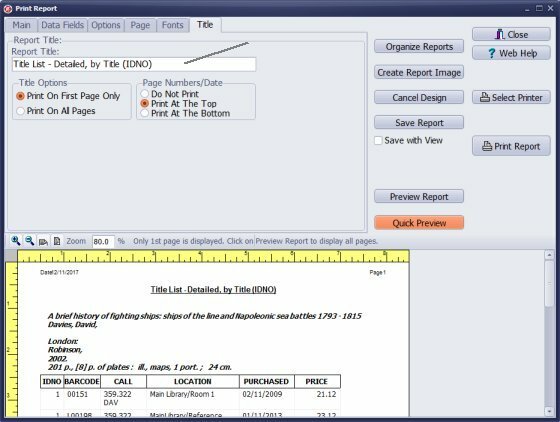 In the Print Report window Click Save Report to include the report in the library predefined report list. In the Save Report window enter a report name and a report description. Click Save. The same report with the different layout option selected: the copy data is displayed in rows (Fields In Rows). Print report alphabetizing authors. I can print a report with titles of books alphabetized. How do I print a report with the authors alphabetized? You cannot group a list of books by the first letter of the book title or book author. 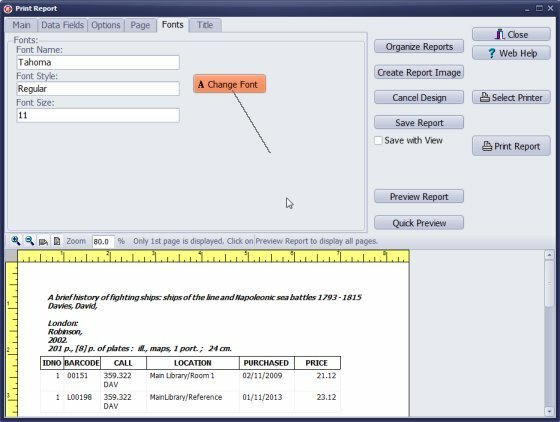 You can set the order of library items included in the report. 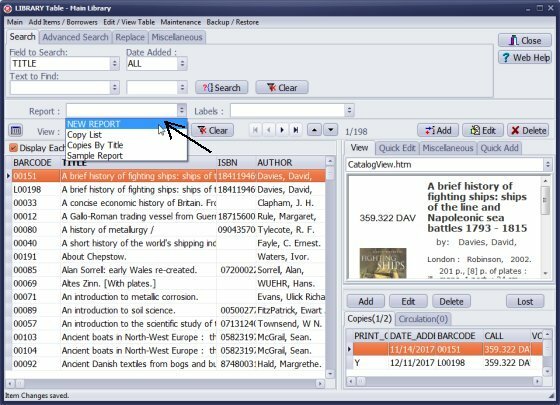 To print items by AUTHOR, set the order by this field in the library catalogue and then generate a report.